The story of Jewish migration in the last 150 years is amply documented. It is a seemingly endless trail of persecution, destitution, and desperate flight from home. Its legacy is written across the world, and is etched into the modern Jewish character: many older Jews will wear expensive jewellery as an instinctive hedge against the possibility that one day they might have to flee. Ultimately—at least from a popular modern perspective—it was a story with a happy ending: those that escaped worked hard and eventually built successful lives elsewhere, securing a bright future for their children. Of course this is saccharine. Like the refugees of today, many migrants remained desperate and obscure, leaving little for history to record. From the fragments that remain, I have reconstructed the life of one unremarkable man. The Pale of Settlement. Odessa is in the South-West on the Black Sea. Nathan Wolkind was born on 21st December 1884 in Odessa, now in independent Ukraine. Odessa was in the Pale of Settlement, an area designated by Catherine the Great as the only part of Imperial Russia in which Jews were allowed to live. There was an ebb and flow of further restrictions, but Nathan was born only a few years after the May Laws were enacted, reversing a trend of liberalisation. Under the new laws, Jews were not permitted to move to other towns or villages, and on some local interpretations were not even allowed to move house. Odessa, on the other hand, was a relatively safe place to live as a Jew: the community was large and relatively well integrated. 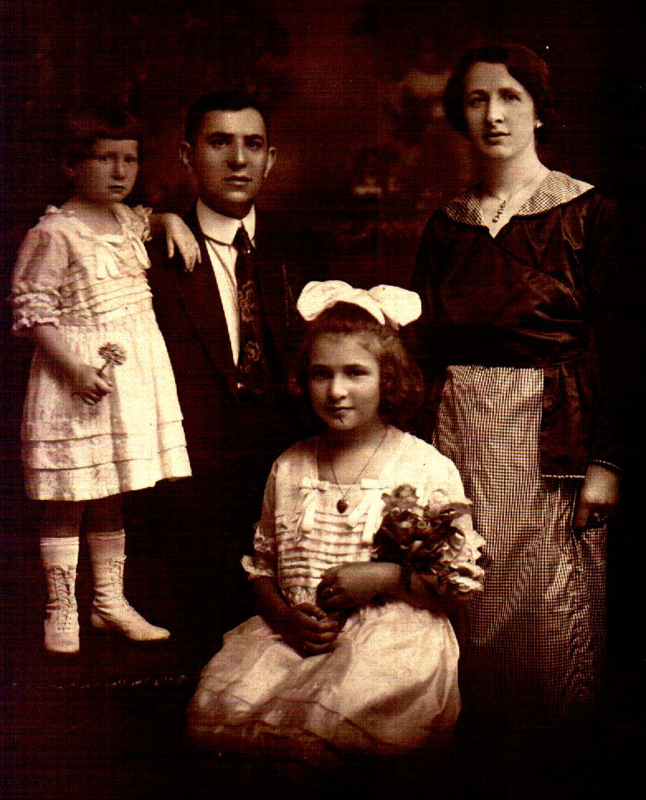 However, life was far from secure for the Wolkinds and their community, and despite Odessa’s relative safety, anti-Jewish feeling was still widespread. Rumours of pogroms circulated every Easter, and when Nathan was fifteen a violent pogrom took place across Odessa. Five years later in June 1905, a general strike turned into a destructive riot followed by a military massacre; a subsequent newspaper article blamed the Jewish population for the violence. A few months later, the October Manifesto granted liberties to Russians that could signal the end of the restrictions for Jews, but many of Odessa’s citizens disapproved. For several days in late October, Odessa was the scene of a vigorous and bloody pogrom, leaving hundreds dead and thousands of houses destroyed. There is no record as to when the Wolkinds left Odessa, or by what means they travelled to their adopted city of London. In 2012 a car journey from Odessa to London covers 1,733 miles in 32 hours; if Nathan was lucky, his journey would have lasted a week or so, taking only what he could carry. He settled with his family in Whitechapel—parts of which consisted of over 90% Jewish immigrants—and in July 1910 married a fellow Russian. Jane Cohen shared a few rooms with her parents, siblings, and four boarders, all of whom had fled Russia in the previous ten years or so. Nathan shared more than a language with Jane: they were both tailors, and may have met at work. 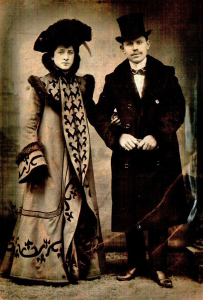 They were married in a small synagogue before posing awkwardly in rented finery. Sixty-four years later the synagogue was demolished, and the space is now occupied—ironically—by a clothes shop. Nathan’s father’s signature and address on the 1911 census return. The following year Jane had entered the Wolkind fold, and was living with Nathan’s entire family in a house attached to his brother’s tobacconist’s shop. Including Jane there were ten Wolkinds under the same roof, and there could have been many more: the census return shows that, of Nathan’s ten siblings, five had already died. Nathan’s brother Solomon seems to have been relatively prosperous, and the house was easily big enough for Nathan and Jane to have their own bedroom. Nevertheless, Jane was already pregnant, and they moved shortly afterwards into Brady Street Mansions. While undoubtedly slum-like by modern standards, Brady Street Mansions was clean, secure, and its residents were proud. Compared to the unimaginable squalor of the East End’s ‘courts’—ramshackle dormitories built over courtyards, with floor space let by the day—Nathan and Jane must have felt fortunate indeed. On 28th September 1911, Jane gave birth in her new home to Clara. Nathan’s contact and address in New York. The fragmentary record falls silent until February 1914, when Nathan travelled alone to New York. This must have been an immensely expensive and arduous journey to undertake without a very good reason. Perhaps Nathan sought work, or was invited by a friend or family member (a name appears on his Ellis Island immigration record, but regrettably it is illegible). Whatever the reason, Nathan arrived with $25 in his pocket, managed to get a job as a compositor at the Jersey City Printing Company, and was living in Powell Street, Brooklyn. Jane stayed at home with Clara for nearly nine months through the outbreak of the First World War, but eventually they made the same journey, arriving at Ellis Island on 8th November 1914. The ships’ manifests of the time reveal that almost every passengers heading for the US was a Russian Jew that had first settled in Britain. Perhaps, sensing the danger from Europe, they wanted to put an ocean between themselves and the homeland which had turned against them. Whatever the reason, Clara and her young child must have attracted curious looks from the other occupants of the cramped third class quarters: their immigration papers describe them as of fair complexion with blue eyes. From left to right: Freda, Nathan, Clara and Jane Wolkind. The area of Brooklyn where Nathan and Jane were living must have looked and sounded very much like their old home in London. In both places almost everyone was a Russian Jew, the language on the street was a mixture of Russian and Yiddish, and on Fridays the air was full of familiar smells as a thousand Sabbath meals were prepared. Nevertheless, living conditions were still cramped, and must have been unbearable in the summer heat: the tiny apartments had gas lighting, which would have been practically unusable in hot weather. In 1915 the Wolkinds were sharing their building with nineteen other families, and a few years later their second daughter Freda was born. Finding life impossible in their tiny hot home, they moved to a more spacious apartment in a building with only four other families. Nathan still had his job as a compositor, and Jane must have felt that it was finally safe to contemplate her growing family’s future. Knowing what happened next, it is tempting to analyse the Wolkinds’ final family picture looking for clues as to why. Is Nathan looking wistful or reflective? Does Jane know something awful? Shortly after the picture was taken—perhaps only days later—Nathan was dead. The horrifying circumstances of his death were reported the same day, Saturday 9th April 1921, by Charles Wuest MD, Assistant Medical Examiner. Asphyxia by illuminating gas – suicide. Was found by wife with gas tube in his mouth and jet turned fully on. No reason ascribed for suicide. Body undressed in bed. Post mortem lividity bright red. The biggest mystery of Nathan’s life lies in the words no reason ascribed for suicide. His death certificate shows that he was still employed at the time; he had a young, growing family; he had found a new life in a welcoming country. And yet he took his own life on the Sabbath, when his wife and children would have been at home to find him. This is a fragment that is irretrievable: perhaps he was mentally ill, an alcoholic, under pressure at work, or—at a stretch—perhaps he could no longer live with the awful memories of the Old Country. I cannot question his reasons. What is certain, however, is that Jane had lost her husband, and the Wolkind family their only source of support. Nathan’s fallen gravestone at Mount Carmel cemetery, Queens. Illuminating gas was a common cause of death, both intentionally and accidentally, in 1920s New York. Nathan’s death was unremarkable and went unreported. 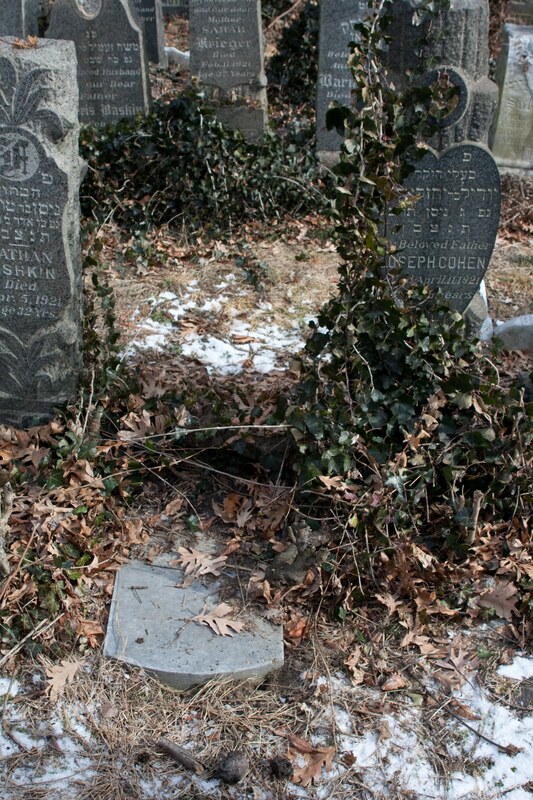 In keeping with Jewish tradition, he was buried the next day at Mount Carmel Cemetery in Queens. After the funeral, Jane and her children returned to their empty apartment and sat shiva for seven days: mirrors were covered and comforts were forbidden. Family members usually look after the bereaved, but the remaining Wolkinds had only their local friends to rely on for support. 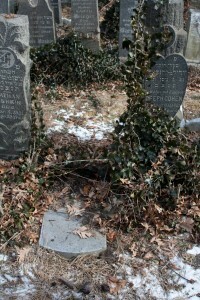 Nathan’s gravestone now lies fallen and uncared-for in a corner of New York City. Freda, Jane and Clara’s picture from their travel document. While in mourning, Jane must have sat in panic at what had to happen next. Despite her family’s residence in London she was still a Russian citizen, and had to find a way home before she ran out of money. In what must have been a baffling maelstrom of bureaucracy and telegrams, a temporary travel document was issued by the Russian consulate. 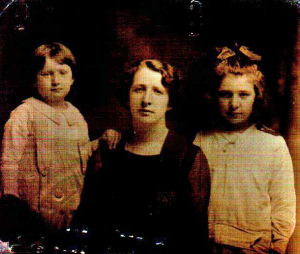 Any type of passport required a photograph, so Jane took her two daughters to a studio and posed with them, in simple clothes, for the last time. On 10th June, Freda walked down a gangplank at Southampton docks to see a new country for the first time; a country that Jane and Clara once thought they would never see again. Sadly, Jane’s ordeal was not yet complete: less than a year after her return to London, Freda died suddenly after contracting meningitis. Jane and Clara remained with their family in Stoke Newington, and somehow rebuilt their lives for the second time, but they no longer had a link to the remaining Wolkinds and quickly lost touch. Nathan’s nephew Jack would become the first chairman of Tower Hamlets council and eventually a CBE; his son is the defence barrister Michael Wolkind QC. Clara married my grandfather in 1938 and lived until I was eight years old; Jane died shortly before I was born. Their stories, and that of Nathan, were reconstructed in part from their memories and those to whom they told about their lives. Anyone can disappear into obscurity, and yet very few live their lives and touch no-one. I urge you: talk to your family, your parents, your grandparents; ask them everything. They may not understand why you’re so interested, but perhaps you could tell them this: many families are eventually reduced to a small pile of documents and some half-remembered stories. The joy, pleasure and pain of live is rarely written down, and yet it is the only thing that can bring our ancestors back to life. Many thanks to Lost Cousins for mentioning this article in its excellent newsletter. My thanks also to Your Family History Magazine for publishing it in their April 2013 issue, and for doing such a lovely job of setting it. Did you know Don Richards? This is fascinating and beautifully written; it’s great that you’ve done this. Thanks Mark — that really does mean a lot. What a very moving story! Thank you for your story. It made me realize how little I understand about my Jewish grandparents lives and their need to find safety in England. A very sad story and I am so pleased that you have shared it. We sometimes have no idea why our forebears did some things or went some places. What a moving tribute you have paid to this family. Very poignant story. Thank you, I have been meaning to write some of the family stories in a way that make them interesting and accesible to non family histiorians, this is my push to start! Thank you for making this ‘short and tragic life’ immortal. Like many of us I am also busy writing family stories, so this delightfully presented piece has given me much encouragement to continue with what can be seen by some as a lonely and pontless passtime – it is not! Thank you Lost Cousins for your wonderully idiosyncratic newsletters. I was very moved by your story. It was well written . Thank you for sharing it with us . I too was touched by your story, I was envious of the amount of knowledge that you have of your Family. My Family came from Somerset UK in 1858, to NSW Australia, but I have no one to ask what sort of life they made for themselves, my only insight to my Great Grandfather are some pages from his diary that he wrote on their voyage out in a sailing boat…. I enjoyed reading your family history. It makes me realise how little I know about my own family background and history in general. Thank you for sharing it with us. A super post Ian – really enjoyed reading it. What a wonderful post, you bring your family to life with your writing. 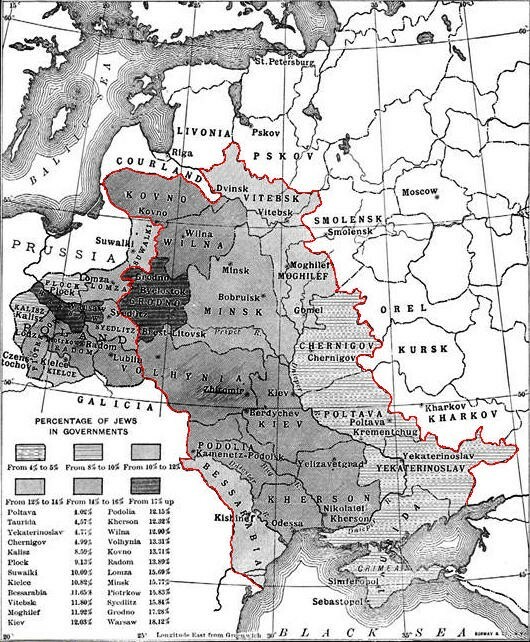 How hard life must have been for our Jewish families through these troubled times.My Teiger family have followed the same paths of migration from Lodz in Poland as many Jewish families did and through my research I have connected with family now spread all over the world. A little light to shine on a dark period in history. Reading this more than a year later than it was in LC but am touched by the story and it brought tears to my eyes. My paternal line are Jewish but don’t really know much about them at all, though am at least in touch with some cousins. It’s very hard to trace family when only a couple of generations were born in England and no one seems to know (or perhaps care) that much about it. Well done for documenting this. Thank you Dad for that thoughtful comment. Sadly it never ends: every day sees people fleeing for their lives from mortal danger and oppression. Let us never forget how important it is — then as much as now — to offer sanctuary to refugees with open arms and generous hearts.